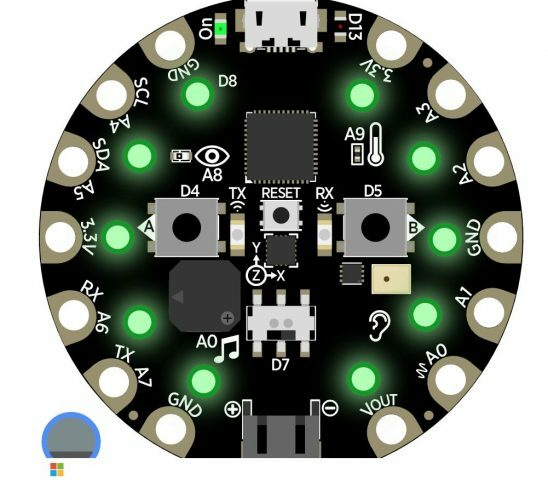 Adafruit Circuit Playground Express reacting to music #CircuitPlaygroundExpress #MakeCode #Adafruit @Adafruit @MSMakeCode @scottturneruon « Adafruit Industries – Makers, hackers, artists, designers and engineers! Robots and Physical Computing writes: use sound levels to make interactive lights on the Adafruit Circuit Playground Express learning board. In a previous post, Adafruit Circuit Playground reacting to music (updated with simulator) using vibrations to change the RGB of pixels on the Circuit Playground Express was played with (it is too much fun to not). Here I am going to go even simpler, using the sound level directly, again using MakeCode. The Circuit Playground Express includes a microphone so sound levels can be used directly, by using them to vary the RGB inputs and brightness of the pixel (see the code above). You can try the idea out on the simulator below; the circle bottom left can be used to simulate varying the sound level.